Moses Show is one of the most exciting Branson shows that you will definitely want to see what’s going on behind the biblical tale. The epic story of Moses will come to life on stage for the first time at Sight & Sound Theater in Branson which will start this March 5, 2016. The unique production show about Moses will feature the iconic plot including the burning bush, parting of the Red Sea, the Ten Commandments, and even the plagues. As the show starts presenting the biblical story, you will get to feel a fascinating experience as the red sea split open for the Israelites to travel the path to freedom. There is no other Branson shows that you can experience with the same combination of feelings that can give you amazement and inspiration as you get to enjoy the fantastic presentation of this tremendous production. There are many reasons why you should bring the whole family to Branson and see Moses Show. This amazing show at Sight & Sound Theater will have you wonder as you travel back in time during the era of Moses when he delivered the Israelites from enslavement in ancient Egypt. Moses followed the commandment of the Lord to lead the children of Israel to a land flowing with milk and honey. Throughout their long journey in the wilderness, they would stick to their faith to achieve what the Lord had promised them. 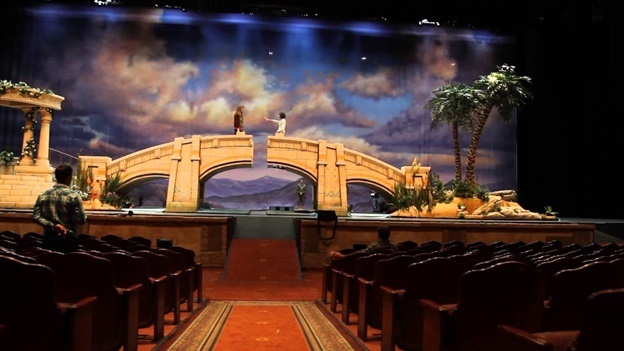 Sight & Sound Theater in Branson has been known for bringing bible story with production shows that include Noah, Joseph, Jonah and Miracle of Christmas. The theater brings to life on stage with stunning costumes, amazing special effects and talented performers. The premiere production of Moses this 2016 promises to bring another must-see production at Sight & Sound Theater. The ticket for Moses Show also includes the Behind the Scenes Tour where professional cast members are the guides for this interactive, close-up experience. Behind the Scenes Tour runs from April 10 through December 10 on select dates. The Behind the Scenes Tour lasts 60 minutes, with the actors as your guide for this close-up look at how the shows at Sight & Sound Theater happen. In this tour, you will learn about set construction, sound, lighting, cast dressing rooms, animals or actors’ areas and more. You will find also in this tour a million watts of lights, sixty-thousand watts of sound, and a stage over twenty-thousand square feet in size. As you participate in the tour, you will discover the technology and ingenuity that powers the dramatic complexity of each show presented in the theater. You will also get the chance to visit the nerve centers that control the lights, sound, stage, and even animals on cue. So, if you want to learn more facts about the epic adventure of Moses, visit the Sight & Sound Theater in Branson where you can also participate with the Behind the Scenes Tour that gives you idea how the shows happen in the theater.